Discover the Grand Victorian Bed and Breakfast, an award-winning Queen Anne that has graced the covers of travel magazines and cereal boxes and more. Once named as one of America’s 10 most romantic inns, the innkeepers continually strive to deserve that reputation. 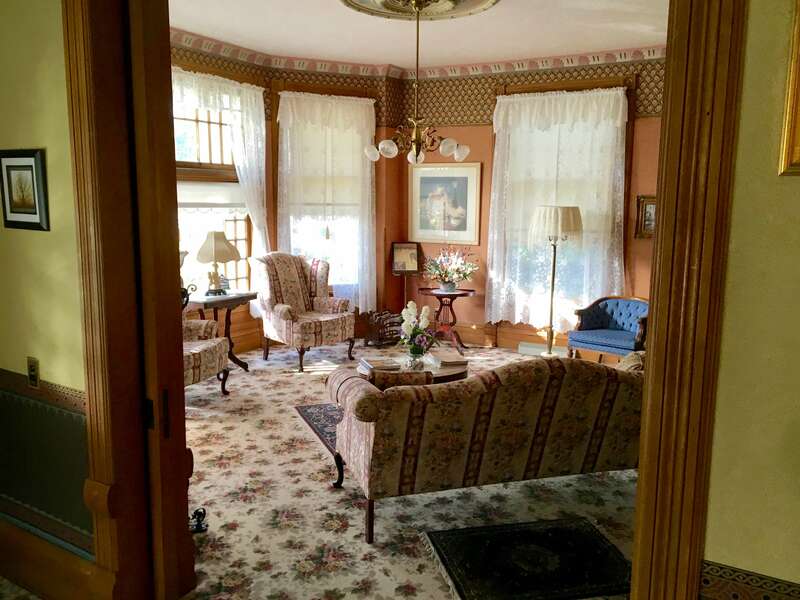 But a stay at the Grand Victorian B&B is also ideal for anyone wanting a great location close to Charlevoix, East Jordan, Petoskey and the Chain of Lakes. Henry Richardi, owner of a woodenware factory, spared no expense when he had the home built starting in 1893. Details include hand-carved oak staircases, a drawing room of exquisite birds-eye maple, chestnut parlor, and hand-carved fireplaces. The home still has its original chandeliers, and bay windows outfitted with etched glass. 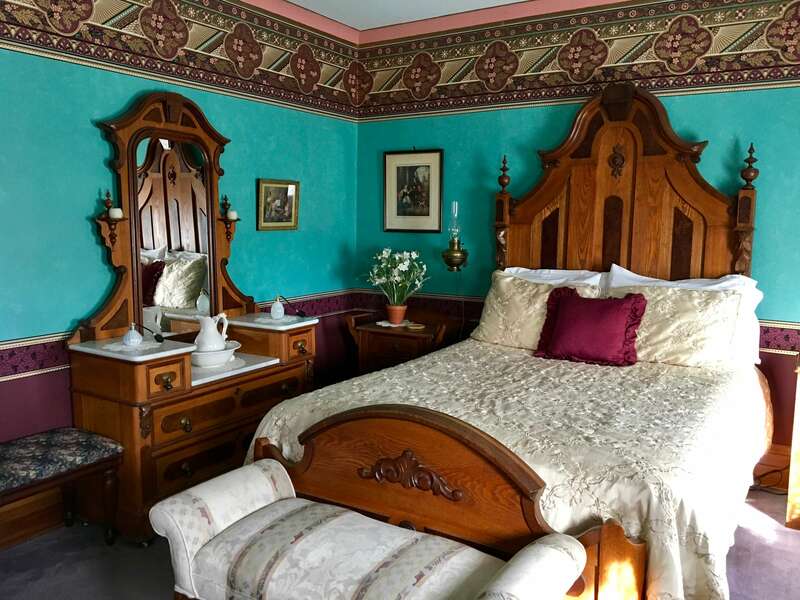 The Grand Victorian Inn Bed and Breakfast simply amazes. The inn features well appointed guest rooms, two with king beds, five with fireplaces, and two with Jacuzzi tubs. You'll find treats in your room. You can enjoy the parlor and porches. After a restful night's sleep on hand-ironed linens, awaken to the aroma of freshly brewed coffee right near your doorway, then mosey downstairs to a hearty gourmet breakfast served in our dining room. It is a short walk to fine restaurants, a quaint theater, numerous shops, and Short's Brewery. Opportunities abound as you spend your days simply enjoying the grandeur of the home or embarking on a short trip to enjoy nearby activities such as golf, swimming, fishing, cycling, or snow skiing. Step back in time to incredible craftsmanship from the turn of the last century. Take a day trip west to explore two lighthouses: Old Mission at the tip of Mission Peninsula and Grand Traverse at the tip of the Leelanau Peninsula. But along the way, you’ll see orchards, vineyards and the waters of Grand Traverse Bay. Stop in charming villages or Traverse City. Take in a winery or two or three. Or head north to the resort towns of Charlevoix and Petoskey, where you can see three lighthouses: Charlevoix South Pierhead, Petoskey Pierhead and, if you take a boat tour out of nearby Harbor Springs, Little Traverse Light. A few minutes away, Torch Lake Cellars offers not only a tasting room but also views of Torch Lake and Lake Bellaire, new winery. Drive 30 minutes to the west side of Torch Lake to visit WaterFire Vineyards. Or take a day trip to the Leelanau Peninsula, where you can take your pick of more than a dozen vineyards. Some people regard the term “Michigan craft beer” as synonymous with Short’s Brewing Company right here in Bellaire. In addition to enjoying flagship beers such as Bellaire Brown and Huma Lupa Licious, your tasting trip might coincide with the release of their seasonal or specialty beers. If beer isn’t your thing, sample Short’s other product line, Starcut Ciders. For bottled beer to go, visit the Bellaire Smokehouse, a short walk from the Grand Victorian. It has the best selection of beers in Antrim County, in addition to which you can buy smoked whitefish and meats to bring back to the B&B for a picnic. Walk out of the back door of The Grand Victorian B&B and explore trails behind the house, about an hour roundtrip. Or walk out the front door, and put your kayak in the offers the Intermediate River, part of the Chain of Lakes that includes Lake Bellaire and Torch Lake. With 10 lakes and connecting waterways, you can make a day of it. We can connect you with businesses that will rent kayaks and either take you to a launch or pick you up, or both. For a less active but still beautiful adventure, boat trips to Torch Lake are available for up to 10 or 12 people. You also can rent bikes nearby, including fat tire bikes. Glacial Hills Pathway and Natural Area offers 31.5 miles of hiking, mountain biking and a winter sports trail. Nearby Shanty Creek Resort, known for skiing in winter, offers plenty of summer activities, including golf, foot golf, disc golf, biking, hiking and more. What started as a way for innkeepers Yuning and Jason to get to know more of their neighbors and fellow business owners in Bellaire has become an extra experience that guests can request at time of booking: Afternoon tea in the Chinese tradition, featuring spring rolls, a couple kinds of cookies, chocolate and, of course, high-quality tea. Tea time is usually from 1 to 3 p.m. and includes a tour of the house. Price varies. Often considered one of the most impressive examples of Queen Anne Victorian architecture, the home built by businessman Henry Richardi over a two-year period starting in 1893 was placed on the National Register of Historic Places in 1978. The Grand Victorian’s stately front elevation has been featured on cereal boxes, cracker boxes and in calendars and magazines. Most guests are curious about the home and want to know more of its history, including why Henry Richardi left town without ever really settling into his mansion and and how he would have been able to boast of having the country’s first “electrified” home. Ask about our romance package, which can be added to a stay in any of our six rooms. Honeymoon couples often seek out our two carriage house rooms, each of which has a king bed, gas fireplace and Jacuzzi tub plus shower.